Michael Gove’s National Curriculum proposals have been out for consultation and have received a fair share of attention. While there has been particular controversy over proposals for history and English, this short paper provides an ‘overview’ –a more general critique of the underlying principles behind the Gove curriculum. To begin with, somewhat ironically, Gove sets himself up as a ‘moderniser’ claiming to be bringing learning in line with practices in countries at the cutting edge of the global economy –particularly those on the Pacific Rim, like Singapore and South Korea. At best, this approach is inconsistent (Morris 2012) and based on inaccurate data (Wilby, Guardian 08/12/2012). It has also been politically selective – though referred to in the 2010 Importance of Teaching White Paper for example, Finland, with high performing schools; but low-key approaches to testing and performance date has increasingly been dropped from the list from which examples are drawn. It is evident also that these ‘successful’ systems are also looking to learn from Britain and other countries (Allen and Ainley 2013). More significant are the arguments about the need to return to a more ‘knowledge based’ rather than the ‘skills’ or ‘process’ led curriculum. This was something emphasised in the 2011 Experts Report commissioned by Gove, however the need to ‘bring knowledge back in’ has also been endorsed by one time curriculum radicals like Michael Young (Young 2008), associated with the ‘social constructionist ’curriculum in the 1970s (Young 1971) and by no means a supporter of the Coalition. Gove himself has been influenced particularly by ED Hirsch, an 85 year old US English Literature professor. Hirsch argues that an enquiry based and student centred curriculum denies poorer children the ‘core knowledge’ necessary to get on in society (an inversion of Bourdieu’s ‘cultural capital’ argument?). Attacking New Labour’s ‘dumbed down’ curriculum, Gove argues that by reinstalling the importance of ‘hard facts’, social mobility will be restarted and opportunities increased. These arguments are being used to narrow and to emphasize particular approaches to learning however. For example, phonics and reading tests for young children in primary schools and requirements that children concentrate on memorising tables or particular types of mathematical calculations at the expense of other numeracy skills. There is also a return to a ‘cultural restorationist’ emphasis (Jones 1989) a ‘Kings and Queens’ history curriculum and an obsession with particular literary texts rather than others. Rather than encouraging the ‘diversity and responsible citizenship’ emphasized in the Experts Report, Gove wants to restore traditional curriculum hierarchies at the expense of newer subjects, effectively returning to a grammar school curriculum for secondary students (Allen 2012). In our book, The Great Reversal, Patrick Ainley and myself argue that rather than being something that promotes and improves individual aspiration and social mobility Gove’s curriculum proposals are part of a wider programme of reversing progressive reform in education and a way of re-establishing education as a form of social control. It was the expanding economy of the post-war period that allowed working class children to move up, not the grammar schools or having access to ‘core knowledge’. In the book we argue that on the contrary, in a ‘declining economy’ social mobility has gone into reverse. It can’t simply be restarted by making changes to education. We use Gove’s proposals for the Ebacc as an example of this. Even if the proposed new EBCs have been rescinded, we argue the proposals set out a new approach to learning and assessment and that this has been continued in the new style GCSEs Gove will introduce instead. 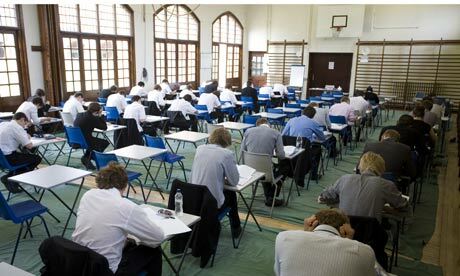 Rather than needing to restore ‘rigour’ to these examinations, Gove’s real problem is that too many students are passing. He wants to create a new ‘correspondence’ between education and an economy with decreasing labour market opportunities. The National Curriculum debate however has been given another twist by statements from Schools Minister Elizabeth Truss that the Coalition plans to allow all schools to ‘disapply’ the National Curriculum for a year (18/03/12 speech on DfE website) though Academies and Free Schools are not legally bound by it anyway. In many respects, a centrally imposed curriculum does not fit well with Tory arguments about reducing the role of the state. Tensions between traditional ‘cultural restorations’ and free market libertarians were visible in the 1980s when the NC was first introduced by Kenneth (now Lord) Baker (Jones, 1989 ). The ten subject Baker curriculum was also quickly trimmed at key stage 4 when the Dearing Review recommended the introduction of vocational pathways for ‘non-academic students’. These tensions should not be over emphasised though and it is unlikely that disapplication will happen this way. The TES (29/6/12) argued that Gove wants to end central government power over what is taught in secondaries. This is in many ways a caricature, because the new league table requirements for KS4 will effectively determine school curriculum provision. Though officially discarding the EBC; future league tables will include school performance in three of the Ebacc subjects in addition to English and maths. Opposition to the Gove curriculum intensifies. As argued, the Gove proposals represent a step back in time. They will not allow teachers the freedom promised in the 2010 White Paper, while the themes and organising principles are not educationally sound and do not provide children and young people with the skills they need to cope with the challenges, but also the problems of the 21st century. There is growing opposition from teachers who have started campaigns, signed petitions and made their feelings known in surveys and opinion polls – ACSL General Secretary Brian Lightman has called for a second ‘Great Debate’ about education while ex QCA Boss Mick Walters looks forward to an ‘education spring’ (Guardian 23/04/13). Meanwhile the announcement of a ‘new’ Tech-bacc at post-16 shows a Secretary of State desperately running out of ideas? Critiquing Gove’s curriculum is one thing however. Developing real alternatives is quite another. This paper concludes by addressing some of the more general issues that need to be considered. To begin with, because of the social significance of education as a whole, the curriculum cannot be reformed in isolation. It goes without saying that reforming the curriculum depends on reforming assessment and the ‘accountability’ structures that have been imposed on schools –in other words, curriculum reform will be extremely problematic while ‘high stakes’ testing continues to exist. It is also the case that if particular subjects and qualifications are seen as having high labour market currency then they will be studied as much for instrumental reasons as for their educational merits. Anybody who has had experience of teaching or organising citizenship or other personal and social education programmes will be familiar with the problems of motivating students. Attempts to reform the curriculum are also likely to counterproductive if a ‘free market’ model of education continues to dominate and programmes to reduce inequalities between different types of learning will continue to fail unless they are made mandatory and subject combinations constrained. How do we bring teachers back in? Teachers and the organisations that represent them, have rightly been concerned at the way in which they have been excluded from decisions about the content and the organisation of the curriculum. Opinion polls also show that teachers, rather than Michael Gove, continue to enjoy the respect of parents (http://www.teachers.org.uk/node/17949) . An alternative curriculum must have teachers as educational professionals at its fore, but this does not mean it is desirable to return to the ‘secret garden’ of the post-war years. The curriculum must be the product of discussions between a wide range of groups in society, in which teacher’s skills and expertise must be valued but not exclusively. Rather than the post-war model of professional autonomy, there has to be a more general democratic process through which curriculum issues are decided. Does the curriculum have to consider the needs of employers and the economy? Of course; but we do have to remember that employers have always criticised education and young people and often appear to be inconsistent in some of the things they say that they want. As argued above, Michael Gove’s attempt to justify importing certain ideas about learning from Asian Pacific countries is not a genuine one. Also, there’s now more concern about whether the global economy is creating the highly skilled and highly paid jobs it is supposed to have been, or whether more young people are becoming ‘overqualified and unemployed’ (Allen and Ainley, 2013). There is a need for good basic and transferable skills, but it’s always been true that people continue to learn many occupational skills ‘on the job’. While it is clearly the case that information technology has changed the nature of work and that more and more people are expected to be ICT literate, Gove’s reforms of the ICT curriculum and the inclusion of Computer Science as an Ebacc subject are not convincing. There’s also a huge debate to be had about the role of ICT in learning and how, rather than ‘teacherless learning’ (Ainley and Allen, 2010 ) more collaborative practices can be developed between teachers and taught. Towards a social justice curriculum. We have to use the space created by the Gove curriculum reforms to put forward some positive alternatives and welcome Lightman’s call for a ‘Great Debate’ We also have to return to a debate about what types of aims and values’ should guide the curriculum. The National Union of Teachers 2013 Conference called for an ‘alternative curriculum framework with social justice at its heart’. While the ability of education to create real social mobility in the labour market can be questioned (Allen and Ainley, 2013) it will always be the case that education has the potential to broaden young people’s social awareness and encourage them to fully participate in society, rather than becoming a marginalised or ‘lost generation’. Allen, M. Ainley, P. (2013) The Great Reversal. Young People, Education and Employment in a Declining Economy. London: Radicaled. Ainley, P. Allen, M. (2010) Lost Generation? New Strategies for Youth and Education London, Continuum. Jones, K. (1989) Right Turn, London: Hutchinson. Young, MFD Ed (1971) Knowledge and Control. New Directions for the Sociology of Education, London: Collier Macmillan. Previous Post As the Treasury recognises it’s ‘financially unsustainable’, will the university tuition fees ‘bubble’ burst?